The mighty and fun loving panda is a symbol of good luck in China and throughout the world, and in the 100-payline Wild Panda slot from Aristocrat, they'll be rooting for you! The mighty and fun loving panda is a symbol of good luck in China and throughout the world, and in the 100-payline Wild Panda slot from Aristocrat, they’ll be rooting for you! This game is a really fun classic that takes you to ancient China and features things like Wilds and Scatters to help you complete big wins. The slot casing is a deep rich red nestled among bamboo shoots, a favorite food of the panda bear. On the reels you’ll find many symbols relevant to the Chinese and Panda theme like a golden medallion, an ancient temple, a koi fish, an umbrella, a money tree, a musical string instrument and a lotus flower. You’ll also find letter symbols nine through king on the reels for chances at lesser value wins. Also be on the lookout for the letters P, A, N, D on the reels on some king, queen, jack symbols. Scatter Symbol – The golden medallion is the game’s scatter symbol and landing 3, 4 or 5 of them anywhere on the reels will win you 4x, 40x or 200x your stake! 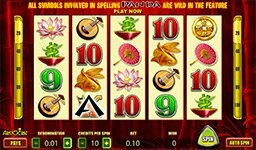 Free Spins – As mentioned above, there is the possibility that you can land symbols with P, A, N, D, A on the reels and if you do spell PANDA across the reels, you’ll win the free spins round. Spelling PANDA anywhere on reels, 1, 2, 3, 4 and 5 respectively starts the 5 free games feature. All symbols involved in spelling PANDA and those particular symbols on all reels, turn into the Panda symbol and substitute for all symbols except the scatter symbol. Panda Wilds – As you see above in Free Spins round you can land the favorable Panda symbol and if you do, that Panda symbol is wild and substitutes for all other symbols except the scatter.